Time-honored excellence for the modern cowboy. The Wild West may have been tamed, but its spirit lives on. This big-bore Henry Lever Action truly lives up to its "Big Boy" name, too. Chambered in the venerable .44 Magnum, it's now ready for the modern shooter! If you're worried, the material is perfectly capable of handling .44 Magnum pressures, so don't hold back on that account. A striking tribute to the days of nickel-plating a gun to protect and enhance its visual appeal, the Big Boy Silver features an innovative plating technique that keeps it looking great. Instead of plating over the base frame material, Henry uses a solid aluminum-bronze alloy that's actually STRONGER than the typical brass alloy. It won't wear or scratch, even through years of use. The frame, barrel band, and buttplate can be cleaned and polished right at home, keeping it brightly gleaming for a generation. Shoots like a dream, looks like a showpiece... on the wall or for Cowboy Action, you can't beat a Henry. 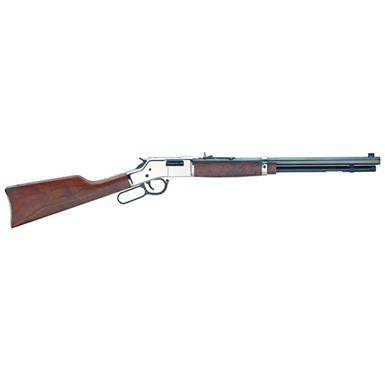 Henry Big Boy Silver, Lever Action, .44 Magnum, 20 Barrel, 10+1 Rounds, 10 Round Capacity is rated 5.0 out of 5 by 1. Rated 5 out of 5 by Battman from This rifle matches my quit draw pistol: .44 special "Bull Dog"
Henry® legendary excellence and the venerable .30-30. Together at last.